Premium MOCs are those where the MOC Designer has provided building instructions for sale, rather than as a free download. There are currently two types of Premium MOC - self-hosted and Rebrickable-hosted. With self-hosted MOCs, the designer is responsible for taking payments and delivering the instructions to the buyers. Rebrickable has no control over this process and cannot offer the file(s) for download at a later time. The self-hosted option is being phased out and will be removed soon as it causes too much confusion with buyers who expect immediate access to the digital files they have purchased. The features described on the rest of this page apply only to Rebrickable-hosted Premium MOCs. During submission, you upload your building instruction file(s) to Rebrickable. The maximum file size for direct upload is 100MB, but files up to 1GB can be uploaded if you do it via an external URL such as Dropbox. Note, there are issues with trying to upload from Google Drive URLs. It is recommended to try and keep your files under 100MB anyway as not everyone has an Internet connection capable of downloading that much data successfully. The file(s) are not stored on the Rebrickable servers, but are uploaded to Amazon S3 in a private bucket. The download links for the file(s) are encoded so that they will only work for the user who purchased the file(s), and they must be logged in at the time. They also have an expiration time of 60 mins (a new link is generated each time the page is loaded). So these links cannot be shared with other users. There is currently no encryption performed on the files, but you are free to add a password to your PDF files before uploading them. However, if the file(s) are password encrypted you MUST provide the password in a separate uploaded file. After the buyer purchases your MOC instructions, they must have immediate access to the file(s) and cannot be required to contact you for a password. NOTE: we will be adding a PDF Stamping feature soon. As with any MOC submission (not just Premium MOCs), you have full control over your MOC details. You can change the image, description, cost, currency, parts inventory, links, etc. To do so go to the MOC page and click the Admin tab. For Rebrickable-hosted Premium MOCs there are currently two supported payment methods - PayPal and Stripe (ie Credit Card). We highly recommend you setup both options if you are able to, although the Stripe method is far easier for most buyers. When the buyer pays via PayPal, you are paid the full amount immediately. At the end of each month, Rebrickable will send you an invoice for the 10% commission on sales made, assuming you owe more than $5 worth of commission. You are also charged the PayPal fee which is typically 30c + 3.6% depending on your country. If you have connected your Stripe account, the user can pay via credit card directly on the site. As with PayPal payments, you are paid immediately but the 10% commission is automatically deducted first. No invoice is required at the end of the month for these payments. You are also charged the Stripe fee which is typically 30c + 2.9% depending on your country. 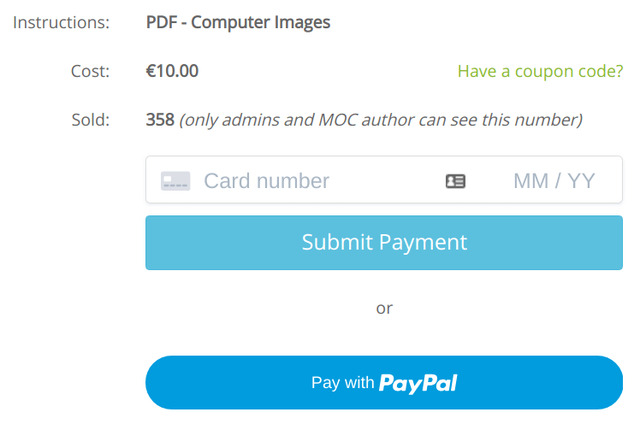 If you have a combination of PayPal and Stripe payments, the end-of-month invoice will only contain the commission amount for the PayPal payments which doesn't allow for the automatic commission as part of the payment process. We currently support USD, EUR, GBP and AUD for Premium MOC payments. If you require something else, please contact us and we will see if we can arrange it. There are two main analytics pages for your MOCs. 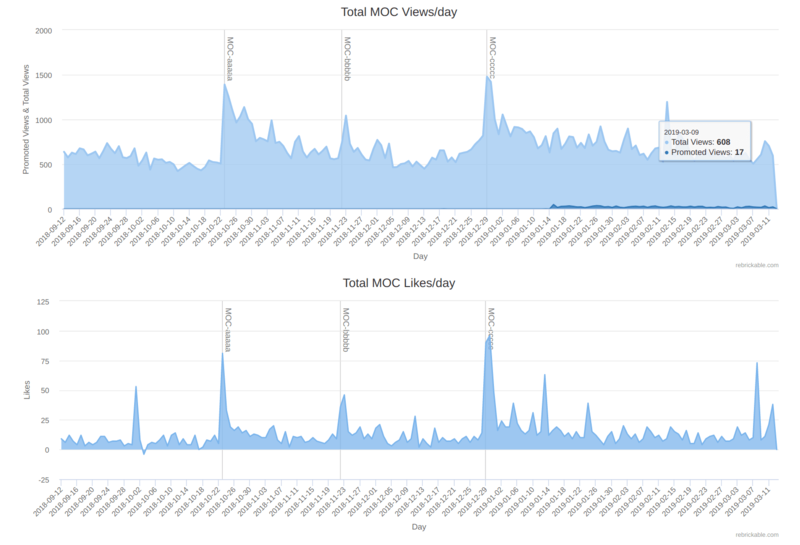 The MOC Analytics page shows you the number of daily MOC views, likes, downloads, etc. If you are on the Designer Plan, you have access to a few more stats such as the daily ranking of Designers and follows/unfollows, but best of all you are able to setup full Google Analytics integration to have your own tracking ID inserted into your MOC pages with full e-commerce transaction support. This page lists all of your Premium MOC sales, including the purchasing user, any discounts/coupons applied, etc. 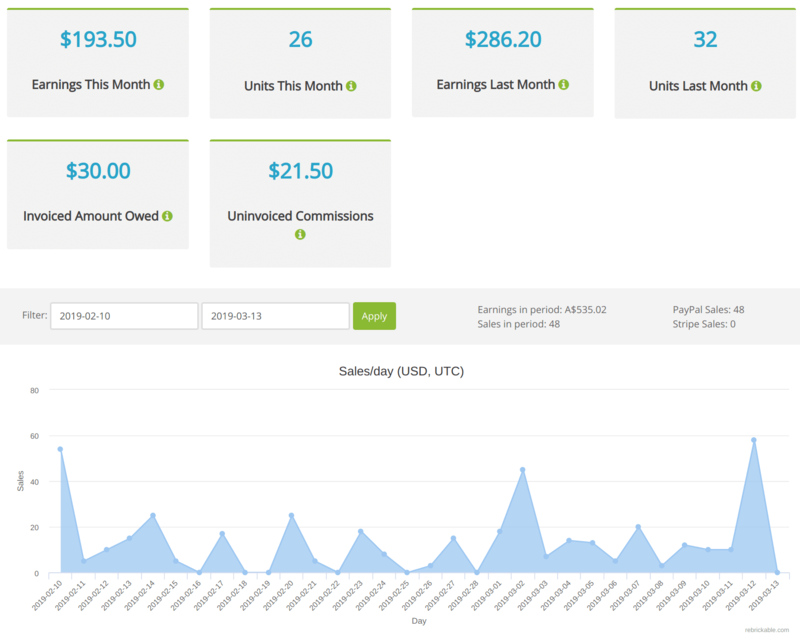 It also charts your sales per day and shows a monthly summary of sales.